Nioxin hair products have been specially created for thinning or fine hair. Their products use advanced technologies to stimulate hair follicles and improve thickness and hair growth. At Bibas we use to a full range of Nioxin products to deliver thicker and denser looking hair. 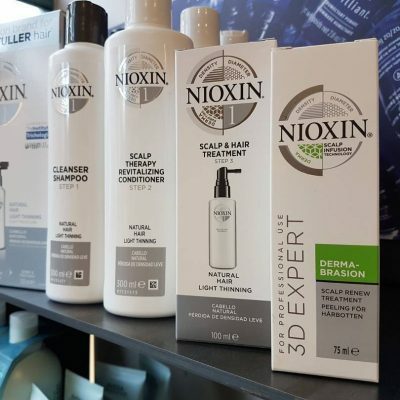 Experiencing hair thinning can be scary but using Nioxin products the team at Bibas have a solution to look after your scalp and boost hair growth. Nioxin hair products will give your hair a fuller appearance. At Bibas our team of stylists are highly experienced both advising on hair thinning and delivering treatments using Nioxin hair products. With proven results Nioxin products provide you with expert treatments to target different areas of care you hair may need.